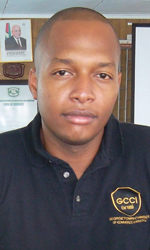 President of the Georgetown Chamber of Commerce and Industry (GCCI), Clinton Urling, said during a recent press conference that there is need to keep a watchful eye on the significant dip in remittances which occurred in 2013. This was one of the highlights of his speech which was based on the Chamber’s views on the 2014 budget. The GCCI President said that one can logically conclude that the country suffered a US$141.1 million deficit in terms of consumers’ ability to spend. He noted that most studies show that remittance monies are used for disposable income purposes and not for reinvestment or for savings. Urling said that nonetheless, the members of the Chamber are pleased with some of the allocations made to certain sectors in this year’s budget. “Proportions for the sector allocations are in the right direction. We see health, security, education and infrastructural upgrades topping the list of sectoral allocations and those are all critical and necessary upgrades for a prosperous society. “We have no problem with the monies allocated. We are also very pleased with the Linden –Lethem road upgrade and the Cheddi Jagan International Airport expansion programme as they provide critical logistical and transportation efficiencies for our private sector and in particular the mining and tourism industry,” Urling added. He noted, too, that it is his hope that the road upgrade would lead to increased cross border trade with Brazil. He lauded, as well, the school programme initiative in this year’s budget which he said is intended to help struggling families get their children to school. The $10,000 per child assistance package was deemed a noble idea by Urling. His only concern in this regard is ensuring that the allocated money reaches its intended audience. “The only worry to some extent is that Government would have to find an appropriate mechanism to ensure that funds allocated under this initiative reach the intended audience. “There would be need for monitoring to ensure efficacy and government would have to spend and utilize additional resources. This question also raises questions as to whether the monies allocated could not have been allocated to increase teachers’ salaries or increase the salaries of the members of the Guyana Police force.